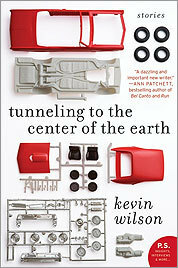 The world of Kevin Wilson's "Tunneling to the Center of the Earth" is at once familiar and new. The stories are set in a believable though exaggerated America of martial arts video games, Scrabble factories, sideshow acts, and spontaneous combustion. With their absurdist elements, these oddball tales recall the fiction of Steven Millhauser and George Saunders. But in this contemplation of what might be, neither science nor the future play a part. Fantasy is found here, but without the elves or quests. The author speculates about alternative realities, sans flying cars and dystopian states. Call it "speculative realism." In the title story, three young adults "just graduated from college with meaningless degrees" find adulthood perplexing. Their solution? Spend weeks digging a labyrinth of tunnels beneath their town. As in the Ben Folds Five song, they've literally gone "underground," embarking on a project earth-bound and impossible. The often lost and hapless characters of "Tunneling to the Center of the Earth" never take a backseat to the idiosyncratic set-pieces, nor are they bystanders in the elaborate plots or any grandiose voice. In the first story, a chilling yet poignant zinger called "Grand Stand-In," the narrator is a 56-year-old woman who works for a "Nuclear Family Supplemental Provider." She role-plays as a "grannie" for upwardly mobile couples who no longer have living parents but feel their children are missing out on a crucial life experience: having a grandmother. "And that's where I come in," she muses. Wilson's stories ask: What is family in the 21st century? Are teenagers wiser than their parents? Are we defined by our work? Interestingly, four of the 11 tales end with characters quitting their jobs or abandoning some pursuit to find change and the clarity to move on. Wilson, a Tennessean who teaches at the University of the South, spins no verbal web. His straightforward, often first-person, narration gets the job done. The only flaw might be Wilson's tendency to rely on exposition. "Mortal Kombat," a stirring story about two Quiz Bowl nerds awkwardly drawn to each other, might have felt even more immediate had it included more dialogue or interior monologue to let the characters speak more for themselves. In this collection, the premises, not the prose stylings, stand out. In Wilson's universe, you can hire a fake grandmother and a "worst case scenario" actuary can calculate your life's risks. In "Birds in the House," four brothers - "half Japanese rednecks in an unhappy family" - decide their inheritance in a contest involving hundreds of paper cranes. In "The Choir Director Affair (The Baby's Teeth)," an infant is born with a full set of choppers. You follow a seemingly ordinary situation until it collides with a small wall of disbelief. Make the leap and enjoy the ride. The situations may veer into the unreal, but the protagonists remain achingly believable. Reluctant cheerleaders, wallflower museum curators, and dead sisters all know "they do not fit correctly into the spaces available to them." They blunder through life anyway, hesitant and desirous, battling their introverted tendencies, and wanting what we all want: a sense of kinship and belonging, a salve for loneliness. Along the way, they come to ponder wise things, such as the narrator who becomes attached to the creepy baby, and later says, "The things we once loved do not change, only our belief in them." Ethan Gilsdorf, who is writing a book on fantasy escapist culture, can be reached at ethan@ethangilsdorf.com. YOU MUST LOG IN to see all of the features available on our new Personal Pages. Want to automatically create your own Personal Page? Just add a comment and click on your screen name.